Last Friday we had a whole school Olympic afternoon. Room 7 and 9 organised all kinds of fun Olympic games we could choose to do. One of my favourites was the equestrian event. We used hockey sticks for horses and had to race down the track! Team Maunga will be putting together a movie to share all the activities with you. Keep an eye on our blog for it. At the end of the day we had our school Olympic ceremony. Three kids from Team Maunga won sportsmanship prizes, Tanner, Teziah, and Ngarino. 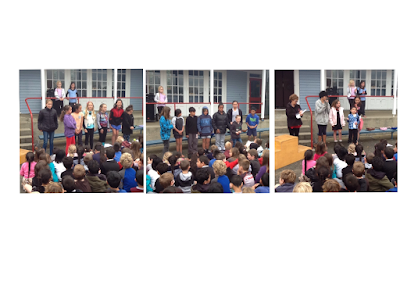 They showed all our school values we are so proud of them! We also had medal winners for overall points. Joel (Room 4) won Bronze, Cody (Room 6) won Silver, and Pauline (Room 5) won GOLD! Team Maunga really enjoyed the day and can't wait for you to see our photos. 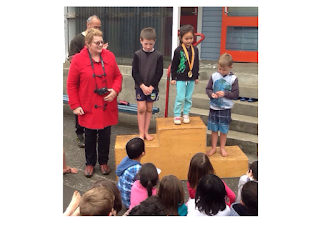 Hi Ohaeawai School, I am Emma from Paihia School.We have just had our Olympics day a few weeks ago.Congratulations to those who have earned a medal.Well done. Hi Room 5 and 6 I'm Brodi from Paihia school, I love the Olympics. What kind of sports did you do? Olympics Afternoon looked so fun I wish I was there. Kia Ora Ohaeawai my name is Teivahnna from Kawakawa Primary School it look a fun and cool day you guys had for Olympic day we also did a Olympic day as well it was fun.Quest what type of subjects do you do and types of sports?Can't wait to see more. Hi I am Zayed at Paihia School. I really like your Olympic day. It made me think of our Olympic Day. How did you win a medal? We won our medals when we tried our best. Did you have medals on your Olympic day?